I am continuing my look at EOS Constitution proposal 2.0. I did my due diligence, read a lot of articles, collected plenty of info and in the end I am writing a summary of the most noteworthy points from the constitution. Important to mention is that this is not the final one Constitution, there are many proposals under way. 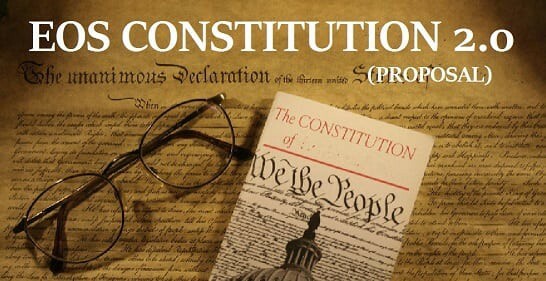 As there are numerous issues with this Constitution a new one Constitution v2.0 is being proposed. I have seen even suggestions about Draft Constitution v3.0. Will keep you updated! I will keep my promise, so today it is my pleasure to update you with some not extremely detailed, but a must to know info about the Proposal of the New Constitution 2.0. Dan Larimer’s idea is to set up new Constitution linked with the first one. And a lot has been done over the last few month. So generally this is a proposal from Block.one, the creator of EOS.io based on DPoS system (Delegated Proof of Stake System)! As most of you are aware the platform went live in June 2018 (see here) and since that time is trying to work out the Governance. As it is stated in Dan Larimer’s article, a certain level of Constitution is needed in order to preserve: Healthy EOS Ecosystem, i.e. So EOS is on the path of becoming the first smart Ricardian contract blockchain. The argument is that with ETH and BTC if things go wrong and people get scammed the code is law, i.e there is no redress and so forth. 1. EOS is first smart Ricardian contract blokchain. Ricardian Contract is legally binding contract, invented by Ian Crigg in 1996. Here are presented all terms outlining a legally binding contract, i.e Offer + Acceptance + Consideration + Intention and adding to that the process of implementation, wherein the defining elements are expressed and executed in software! Big difference. isn’t it! So if there is a bug in the system, the intent of the contract can be proved thanks to the readable text. MULTISIG. It is like a joint signature on bank accounts. So in order to proceed with a transaction there comes the need of requiring more than one key to authorize it, which undoubtedly will reduce the potential of fraud. HARDWARE TIME DELAY. As the name says, in case the alarm sets off, and there is a suspicious activity under way, it can be reversed in a certain time frame. EOS was designed with Touch ID, Face ID, Time Delays. So there are some options to consider for your security! This sounds great, looks like we can decide on the terms of the security: contract terms, code terms and build it up. Overall protection or even ease the burden of the scammed people should be implemented. It is written that charitable donations from the side of the BP are highly welcomed in case there is a need of helping such people out. And is much better for the ecosystem than interfering directly in it. Any suggestions and ideas will be highly appreciated by @yanika! Disclaimer: This review is my subjective opinion and analysis, not investment advice. Originally published at trybe.one on October 8, 2018. A tokenized knowledge sharing network for the cryptocurrency and blockchain communities.